When President Trump signed an executive order yesterday directing his administration to rewrite the “Waters of the United States” (WOTUS) rule, he was making good on a promise he had made to industrial livestock producers on the campaign trail. And the livestock industry applauded this news. Environmental groups, on the other hand, expressed dismay. “Gutting this rule would threaten the wetlands and streams that feed the drinking water sources for 1 in 3 people—or 117 million Americans. It would put our rivers, lakes, marshes, and bays at risk of pollution,” the Natural Resources Defense Council said in a statement. And while much is yet to be seen about how the executive order will play out, it’s clear that WOTUS is just one piece of a larger puzzle. Industrial livestock proponents have long attacked “burdensome regulations” as a key roadblock to their success. To hear them tell it, a combination of environmental protections, animal welfare rules, and policies associated with strengthening market competition have long threatened their existence. Now, with the election of President Trump, and the large Republican majorities in Congress and in state legislatures across the Livestock Belt, hopes are growing for a massive regulatory rollback. The WOTUS rule was finalized in 2015 and was the Environmental Protection Agency’s (EPA) attempt to clarify the regulatory boundaries and jurisdiction for water protections. The Obama-era EPA conducted a years-long process to formulate WOTUS in an attempt to answer long-standing questions about which wetlands, streams, creeks, and other bodies of water are governed by the federal Clean Water Act. Throughout the rule-making process, the NCBA and NPPC coordinated with other industrial agriculture groups to challenge the WOTUS proposals. 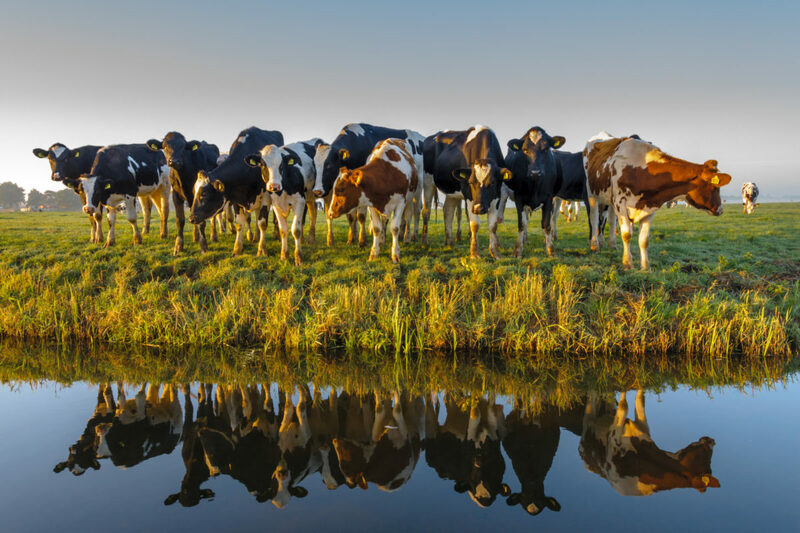 Livestock producers and the agricultural press were filled with a steady stream of WOTUS worries, such as concerns that farm ponds and ditches could fall under Clean Water Act permitting rules. Front organizations such as the Waters Advocacy Coalition were formed in an attempt to challenge the rule. The American Farm Bureau Federation, helped to coordinate WOTUS challenges with a social media and video campaign, #DitchtheRule. In July 2015, after the rules were issued, the NPPC and NCBA joined with other industry groups in suing the EPA to halt its implementation of WOTUS. Similarly, lawsuits were launched all around the nation in a well-coordinated legal attack. One such suit was filed by recently confirmed EPA Administrator Scott Pruitt. More than 100 lawsuits moved along for 18 months, and were consolidated into a group in the Sixth District Court of Appeals. Then, in January, the U.S. Supreme Court waded into the legal fray, deciding to take up WOTUS as part of its 2017 docket. Now, that process has been further complicated. With the signing of the executive order, President Trump has directed the EPA to “review and reconsider” their 2015 WOTUS rule. The nomination and approval of Pruitt as EPA chief was the livestock industry’s first big win. The former attorney general of Oklahoma has a track record of supporting the industrial livestock sector. “It doesn’t matter whether you’re talking about antitrust issues, manipulation of livestock prices, national security and food security, the Farm Bill, or environmental protections, the commodity groups want to write the rules. Or get rid of the ones that stand in their way,” said Tim Gibbons, an organizer for the Missouri Rural Crisis Center. His organization is made up of 5,500 farm and rural families who collaborate to assuring a future for independent family farmers, and improve competition and transparency rules in the livestock market. The Center has long decried the policy positions and approach of the “commodity groups” like the NPPC and NCBA. From the National Corn Growers Association to the American Soybean Association, the commodity groups often work together on national and state-based policy issues. They tend to collaborate on legal issues as well, forming a nexus of industrial agriculture support for the pro-corporate agenda. But like the commodity groups with their friendly relationship around a common agenda, groups like Gibbons’ collaborate to resist the industrial livestock lobby. Missouri’s northern neighbor is home to Iowa Citizens for Community Improvement (Iowa CCI), which does similar work. Nick Schutt became involved with Iowa CCI when an industrial livestock firm decided to build a 3,000-head cattle feeding facility half a mile north of his farm. “This is the type of operation that puts people like me out of business, making it so I can’t even get in,” he said. Schutt dreams of making a living as a small dairy farmer, but fears the industrial livestock agenda will make it impossible. So for now, like the vast majority of family farmers, Schutt works off the farm at the local grain cooperative. Patty Lovera, the assistant director of Food and Water Watch, reflects on watching WOTUS over the last two years, and believes the rules were routinely blown out of proportion as a way to scare farmers. “This was not accidental. It was clearly manufactured. It’s part of the demonizing of the actual concept of industry regulations,” she told Civil Eats. Lovera likens the way farmers feared the impact of WOTUS to an “urban myth, only this time … we’re talking about rural communities, but this time the myth really happened.” She points to the fact that the EPA responded to industrial agriculture challenges by pointing out that WOTUS, in nearly all cases, exempts farmers from Clean Water Act permit regulations. Meanwhile, groups like Iowa CCI, the Missouri Rural Crisis Center, and other grassroots organizations will keep asking questions and holding the industrial livestock agenda accountable throughout rural communities. Nick Schutt worries that industrial livestock groups will double down on their growth, now that all regulation is likely to be challenged. But he vows to keep fighting false controversies. “People learn the truth when it comes to their doorstep. Before that, they don’t ask questions,” he said. Good to see Bryce Oates in action. And a well-reasoned piece. I worked for several years as an environmental lawyer for environmental groups (particularly on livestock impacts), so I am very familiar with the laws and regulations in question. This is an important issue. But my concern about the article is that it suggests this rollback was at the behest -- primarily, if not entirely -- of the livestock industry, which is simply untrue. The vast majority of agricultural pollution to water in the United States is actually from row crop production. There was at least as much effort by that portion of the industry to get rid of the rule.